Toshiba's first ever all-in-one desktop PC, the All-In-One DX1210. 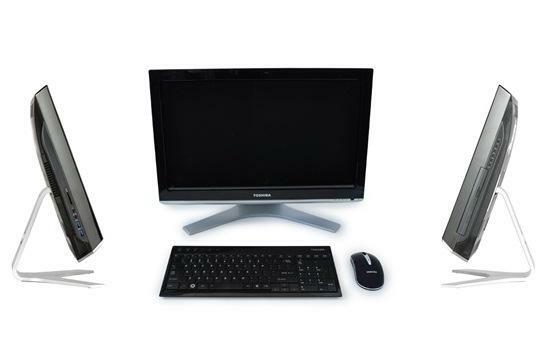 Toshiba has announced its first all-in-one desktop PC product, the All-in-one DX1210 PC. It is available now on the Australian market from selected retailers, including Harvey Norman, and starts from $1899. The Toshiba's All-In-One DX1210 PC has a 21.5in Full HD touchscreen and it's available in either Intel Core i5 or Core i7 second generation (Sandy Bridge) processor configurations. The PC is designed for home users and Toshiba touts is as a hub for all computing and multimedia needs. Anthony Geronimo, Toshiba's B2C product marketing manager said in a media release that "it's not uncommon for households to have several technology devices in different rooms, so the DX1210 is a great solution to managing multiple devices through a single hub. Families can use the All-in-one as a base for connecting and managing other notebooks, tablets or smartphones". The Toshiba DX1210 PC includes HDMI-in, six USB ports (including two USB 3.0 ports), Gigabit Ethernet, Bluetooth, 802.11n (2.4GHz) Wi-Fi and an SD card slot. It also comes with a Blu-ray drive, a digital TV tuner and a 1TB, 7200rpm hard drive. The USB ports support Toshiba's Sleep-and-charge technology, which allows USB-based devices (including the iPhone) to be charged even when the PC is not powered on. Another nifty feature of the PC includes Sleep & Music, which allows music to keep playing even when the PC is in sleep mode. Along with an Intel Core i5 or Core i7 CPU, the configuration includes integrated Intel HD 3000 graphics, which gives the all-in-one PC respectable performance when it comes to playing games such as World of Warcraft or Startcraft2. However, the DX1210 isn't a gaming machine; it's designed as a PC that can be used to perform everyday computing tasks, social networking and communications (a webcam is installed), and it can even be used as a media centre and PVR (it comes with a remote control). The Toshiba DX1210 is an alternative to HP's Touchsmart PC, which hasn't had much competition in the consumer space. The all-in-one design means that the DX1210 is neat and easy to set up and use and the touchscreen allows it to be used as a kiosk of sorts for playing media files. Furthermore, Toshiba supplies an application so that users can leave notes on a 'virtual corkboard'.